As someone who did read Mary Norton's The Borrowers book series as a child, I was extremely interested in seeing the Disney film The Secret World of Arrietty. Although neither my husband nor myself are fans of anime in general, we both thought that the past Studio Ghibli films, Ponyo and Castle in the Sky, were very well done. The whole family was very excited to have the chance to attend an advanced screening of this new Studio Ghibli production in Boston last weekend. This film is about bravery, friendship, and dreams coming true. It also brings up the subject of mortality, and more specifically, mortality in children. This movie depicts the Borrowers to be as charming and endearing as I remember them to be from the books. These tiny people, who call human beings "human beans" and use postage stamps as wall art, have successfully won over my children as well. One thing that made this film a huge success is the magnifying of everyday noises, even the smallest. The audience heard all these sounds as a Borrower would living in a human size world. This clip explains what a Borrower is very simply . 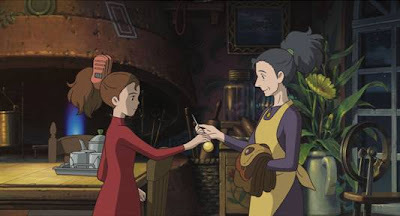 . .
Our heroine, the 14 year old Borrower named Arrietty (voice of Bridgit Mendler of Disney Channel's Good Luck Charlie and Lemonade Mouth) had been taught to live in fear her whole life. She eventually proved to her parents that there are exceptions to the rule, by befriending a 12 year old human boy named Shawn (voice by David Henrie of Wizards of Waverly Place) and eventually the cat, two beings she had been trained to avoid. 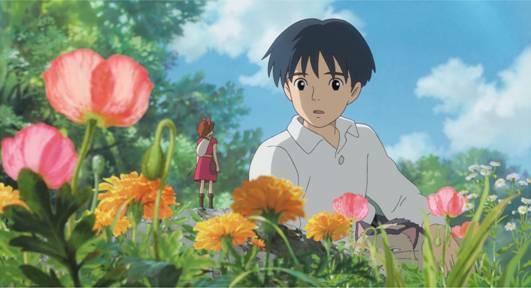 This film occurs all in a matter of days, which started with Arrietty's first borrowing . . . a rite of passage for any young Borrower. Her overprotective mother Homily (voice by Amy Poehler of Saturday Night Live) is always anxious, especially when her husband Pod (voice by Will Arnett of Arrested Development) is off borrowing. My children's favorite parts of this film are the humorous ones, something not seen in all Studio Ghibli films. It was interesting to hear the audience, the majority of which were adults, laughing out loud at both the subtle and obvious humor. The rogue Borrower Spinner and the scene with our villain Hara the housekeeper (voice by comedienne Carol Burnett) and the crow made the top of our children's favorite things about the movie. In the end, I am extremely pleased that the movie sparked enough interest for my 8 year old son to want to read The Borrowers book series. We have covered the bravery and the friendship, but what about the realization of dreams? Well, you will just have to watch the film to find out. 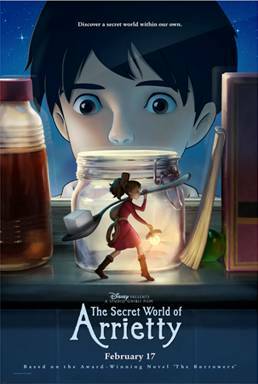 The Secret World of Arrietty opens in theaters today! 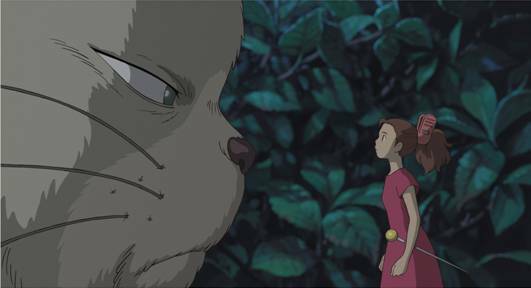 After you watch the film, I would love to know if you think there will be a sequel coming our way from Studio Ghibli. My family attended an advanced screening of this film to facilitate this review.